British English Quiz — By The Oxford Dictionary. >> British wedding photographer — Oct. 9, 2014. >> “Top Gear” Falklands was a farce — Oct. 1, 2014. >> White house will never appreciate — Aug. 25, 2014. >> Very best in British humor — Feb. 28, 2014. I was going to cut off one of my ‘knackers‘ if I even got one wrong. Click to access Quiz at the official ‘Oxford Dictionary’ Website. Pope Francis, With His Change Of Tone On Gays & Divorcees, Could Lead Catholic Church Towards A Very Real Schism. and that there has been one since Vatican II. But, things changed with Benedict XVI’s resignation. as far as sedevacantists are concerned. And then Francis has gone all liberal. and do a John Paul I (#264) on him. Pope Francis’ Private Secretary, Ex-Benedict’s “Pet Boy”, Stabs Francis In The Back Re. Gays & Divorcees! Refer to my post of yesterday. I told you. Catholic Church does NOT PLAN to change doctrine. given that folks have always had doubts about him (and the German pope)! A private secretary contradicting his boss, the current pope. that goes ‘home’ each night to the ex-pope! You did KNOW that right? I have talked about it enough. It is NOT kosher. Please read, then depending on your stand on this either weep or laugh. Click to access FULL original at ‘lifesitenews.com’. A MUST READ. 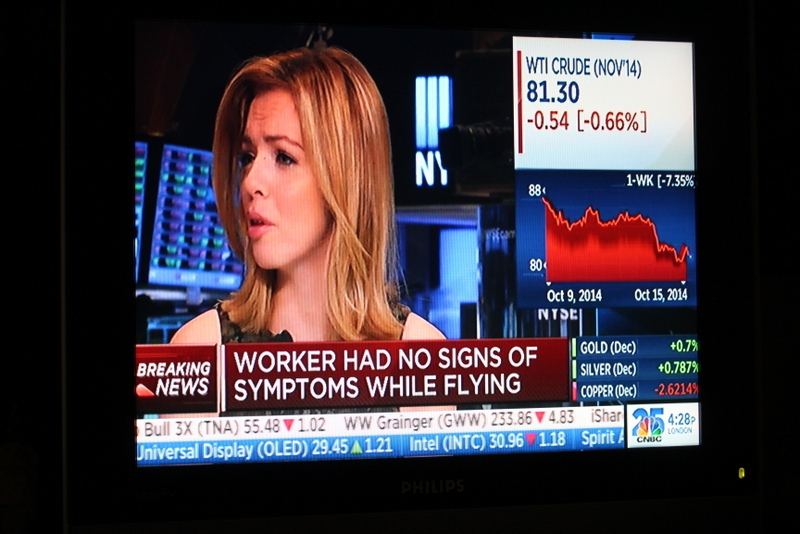 CNBC Has A Whole New Bold (& Blue) Look, With Red Charts & 3 Bottom Tickers. Old, pre-Oct. 13, 2014 look. Click to ENLARGE, IF you must. From the little snippets I have heard, on air, from CNBC ‘talking heads’ this is supposed to be a bold new, ‘in your face’ look. I am, really, what sanguine about it, but being the writer that I am, I am using it in BOTH of its connotations. What disturbs me, and any psychologist will readily concur, is all the Red. Red is known to be a color that invokes at a minimum unease, if not aggression. In all my decades of doing presentations I was very careful as to how and when I used Red in my slides. But here is the ‘funniest’ thing. The predominant color of the new look, as you can clearly see in the above photos, shot with my Canon T3i, this morning around 11:30 am (Eastern) [as you can confirm from the ‘bug’], is BLUE. Now that is strange. 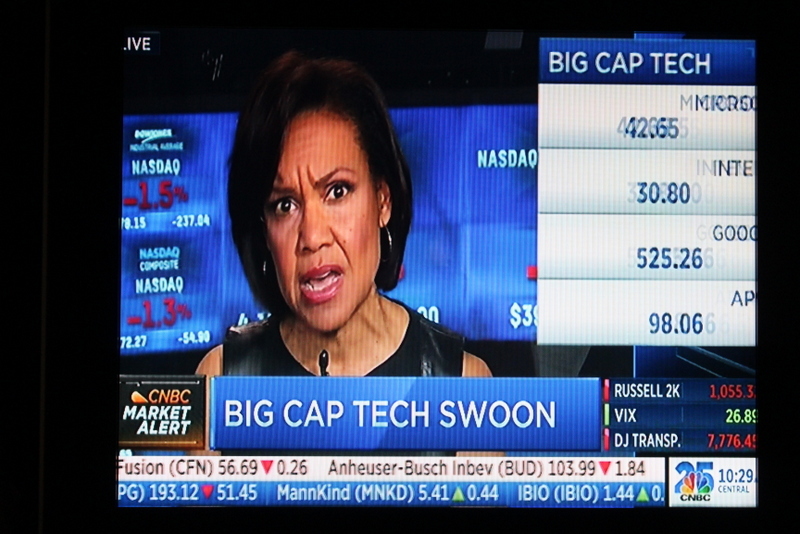 In the Red–Blue politics of the U.S., CNBC is so, so, so damn Red that it would be appropriate to always refer to them, in our British lingo, as ‘bloody‘. So why the Blue? Were they hoodwinked by a liberal design team and that this is the most expensive prank in TV history. 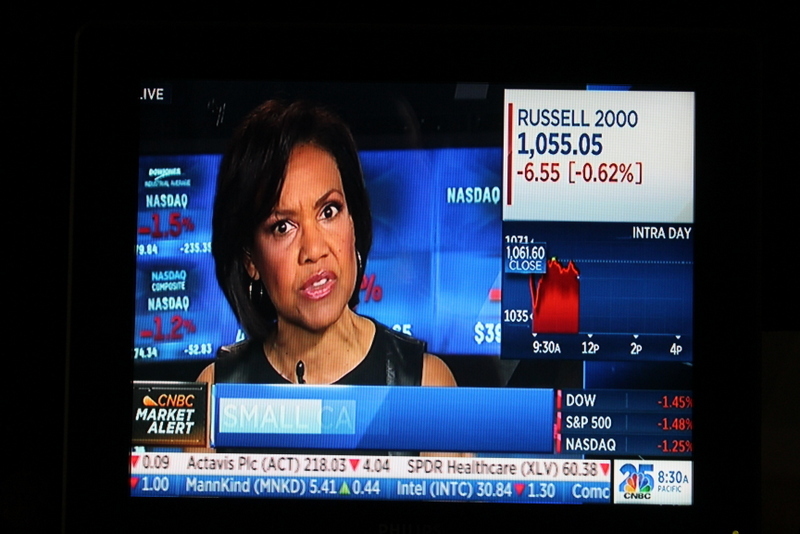 CNBC ending up with a multimillion dollar blue set without realizing that they have been set up? What I do NOT get are the RED charts. Yes, I have seen a few GREEN ones BUT I cannot fathom what the Red and Green signify. No, no, NOPE. It is not based on the current tick, i.e., Green if ‘+‘ and Red if ‘–‘. Maybe it is not the latest tick but maybe YTD. But I have seen Red charts when the latest tick is ‘+‘ and Green charts when the latest tick is ‘-‘. Maybe they got it wrong. I do NOT like Red Charts! Just compounds the negativity. The ‘in your face’, close ups of the presenters doesn’t bother me, other than with bloody Joe Kasey Khan Kernen. The BEST new look that CNBC could have had was to get rid of Kernen. He is a disgrace. But, it is OK. 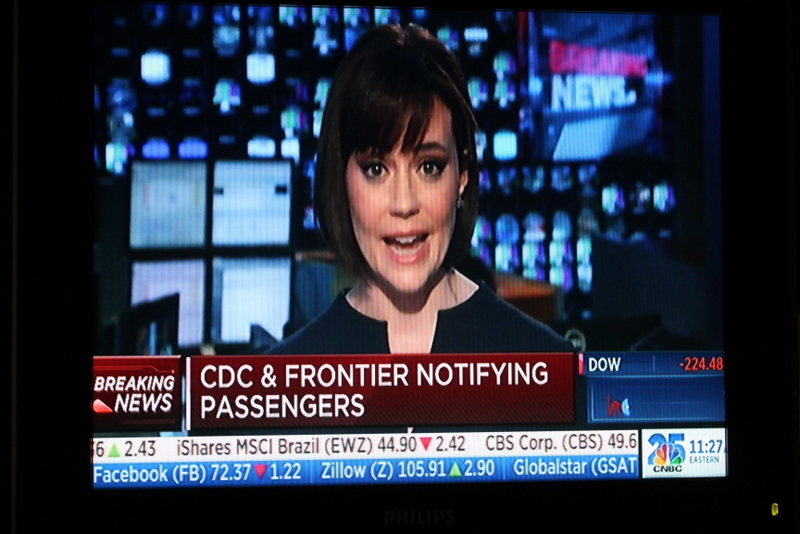 I like that the tickers show ‘%’ more often than before. I like ‘%’ as opposed to absolutes because that can be more meaningful. It is just the Red charts. Revels (Cambridge, MA) 2014 Christmas Revels, ‘A Victorian Celebration’: Tickets On Sale Oct. 20. >> Christmas Revels 2014 at Dartmouth — Aug. 11, 2014. >> Christmas Revels 2013 at Dartmouth — Dec. 16, 2013. >> Christmas Revels 2012 at Dartmouth — Dec. 17, 2012. >> Cambridge Revels, 2013 — Dec. 27, 2013. >> Cambridge Revels, 2012 — Oct. 18, 2012. Click to access ‘Revels.org’ Website — a very beautiful one at that. I would like to go. I will have to see. Already have my usual front-row, center aisle seats for Revels North at Dartmouth for 2014. Got those months ago. Yes, Christmas is a LONG way away — and I am glad. So much to get done before then. >> Doctor who misdiagnosed Eric Duncan — Oct. 9, 2014. 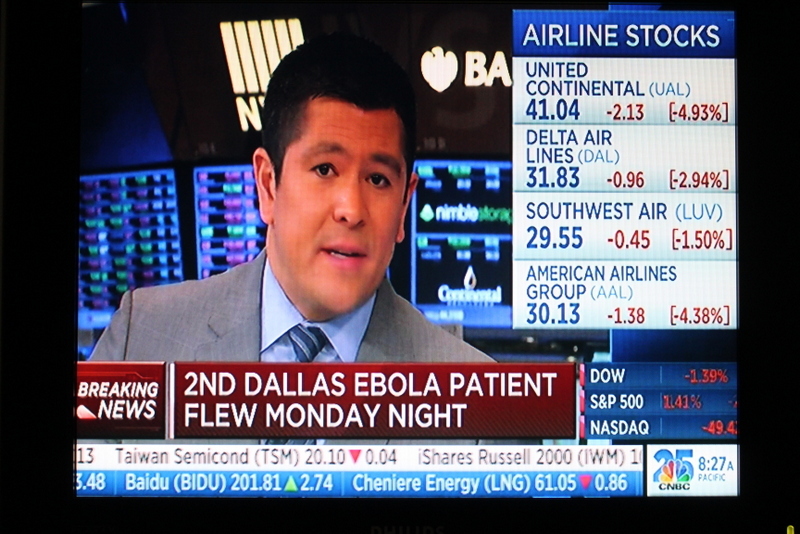 >> Who is paying for Dallas Ebola patient — Oct. 1, 2014. This is the Interim CEO of “Texas Health Presbyterian” in Dallas (TX), Jim Berg. Click to visit THEIR Website. Makes interesting reading. First Question: WHY has he been INTERIM President and CEO for 7, yes, SEVEN, years? That alone is suspicious. Is he not qualified. Second Question: Why isn’t he already in police custody because I am sure this will eventually boil down to criminal negligence on the part of this accursed hospital. I already said on October 9 that this hospital was screwed — it might as well declare bankruptcy now. Well that was a week ago. Things have turned much more ugly. IF an innocent patient at this hospital contracts Ebola from a nurse, who was also providing care to Eric Duncan, all hell will break lose. They have already, from what I heard over the weekend, stopped accepting ER patients. As of TODAY they should stop accepting ANY patients. Basically the hospital should be put on lockdown. No new patients. This hospital should be closed — in time. I hope it does not end up as a SAD and frightening edificial memorial to Ebola in the U.S.? This is crazy. Disgrace to the U.S.
Where the heck is Rick ‘am I awake’ Perry? Sleeping on the job or is it with a campaign worker? Mark my word. This hospital has to go. All of this because some idiot doctor MISDIAGNOSED Eric Duncan. He should be arrested. We should know who he is. People must know. Come on. Lets have the name. Most likely a U.K. tabloid will get it soon. Jim Berg … do the decent thing. Resign and go to the nearest police station and give yourself up. Let CNN’s Dr. Sanjay Gupta run this hospital — albeit to the ground.